Let us start with a cross polytope in 4 dimensions. If you run lrs on this file you see that it is degenerate with each of its 8 vertices having 6 lex-pos bases. 1. We select vertex 0 1 0 0 and ask for all lex-pos bases that contain it. It is contained on 8 facets in the file cross4.ine: all of the facets with a +1 in column 3. Add the normals of these facets together to get an objective function z= 8 x2 that maximizes at 0 1 0 0. 2. Now run lrs in linear programming mode to get a lex-pos basis for the vertex 0 1 0 0. 3. We now use the cobasis 8 10 12 14 to do an lrs run on cross4.ine with the truncate option. 4. You obtain a list of the 6 lex-pos cobases that represent 0 1 0 0 and also 4 other cobases that you simply discard. 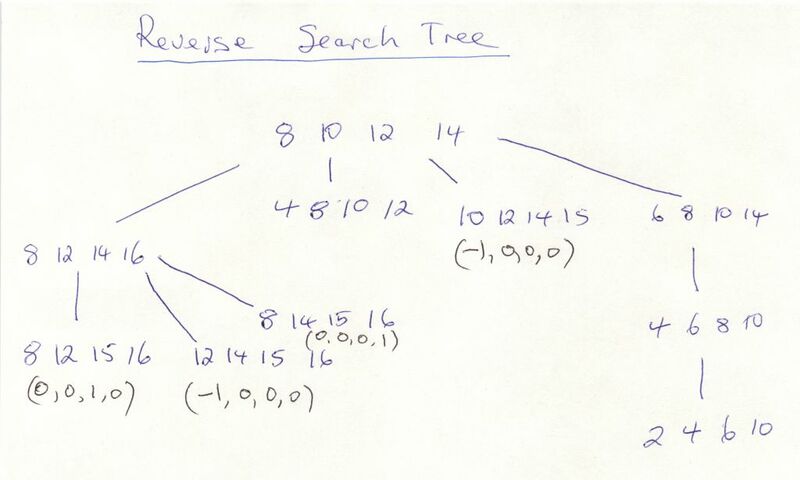 The reverse search tree corresponding to step 3 is below. To see how it is constructed, note it is a depth first search tree based on the height parameter h=integer in the above output. Note that their are 6 vertices adjacent to 0 1 0 0 on the polytope of which 3 are computed, and one, (-1,0,0,0) appears twice. So this is not equivalent to computing the vertex figure at 0 1 0 0. To understand this tree, it is useful to compute all lex-pos bases of the polytope by running step 3 with 'truncate' removed. In the full reverse search tree containing 48 notes, we see that the cobases 4 8 10 12 and 2 4 6 10 are leaves of the tree, so no truncation is performed. The remaining 38 nodes of the tree are all in subtrees of the truncated vertices. The maximum depth is 8.